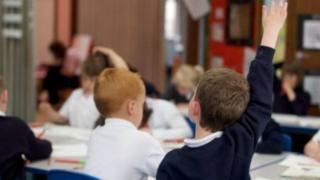 Scotland's largest teachers' union has given more details about its plans for a strike if a pay deal is not reached. The EIS plans to start a strike ballot on 11 March and said it could stage a walkout on Wednesday 24 April - the day before school exams begin. Union members have rejected a pay offer worth 9% by April plus 3% next year. The EIS executive said it would not take any strike action during the school exam diet but could strike again in June. The plans still needs to be approved by the union's national council. Employers have, in effect, got a fortnight to make an improved pay offer or there will be a strike ballot. Negotiations are due to take place on Tuesday. Union law means two thresholds need to be crossed in a ballot before teachers can go on strike - the turnout in the ballot needs to be at least 50% and at least 40% of those entitled to vote need to back a strike. Members of the SSTA union have, however, voted to accept the current offer and indicated that they would not be prepared to strike on pay. The two unions still plan to work closely on other areas of concern such as workload and worries about support for children with additional needs. This includes the potential for co-ordinated industrial action. The council umbrella body Cosla and the Scottish government have both said that industrial action would be in no-one's interests and want to see a negotiated settlement. They have described the existing pay offer as the most generous in the UK public sector but indicated they were open to finding ways of dealing with issues such as teacher workload.